In Chinese astrology, 2011 is the Year of the Rabbit. In Tofino, it’s the year of the Growler. This town simply couldn’t wait any longer to try Tofino Brewing Company’s first craft beer. The three guys behind Tofino’s new microbrewery – Chris Neufeld, Bryan O’Malley and Dave McConnell – were set to release their Tuff Session Ale in May, but apparently that wasn’t quite soon enough. The traffic at the brewery on Industrial Way was such that they started offering up growlers and kegs ahead of schedule, in mid April. Growlers are 64 oz reusable glass jugs (or 1.89 litres – almost equivalent to a six-pack) that cost $10 to buy and $10 to fill. Maybe the excitement has something to do with the number of times the rumour of a potential microbrewery has floated around Tofino (one the first article I wrote for this magazine many years ago was about a brewpub/ brewery that never materialized). This is a town was clearly ready for its own brew. The first seasonal to be released will be the Hoppin’ Cretin ipa, followed by another one for the summer. The man behind the beer is brewmaster David Woodward. He most recently worked at Whistler Brew House, where he made a name for himself with big, flavourful beers. The Tuff Session Ale is described as a light to medium bodied pale ale with a toasty malt base, balanced with West Coast hops. For the partners, putting together a brewery has been a learning experience. Over the past year and a half they have sourced equipment and ingredients, secured their brewmaster, and basically learned all they could about the brewing process. None of the three had experience in the industry themselves, although brewing does run in O’Malley’s family (his grandfather had a brasserie in Montreal). Despite this, they’ve managed to find innovative ways to reuse the byproducts of the process. First of all, the 12-hectoliter brewhouse is solely powered by hydroelectric power. Spent grain from the Tofino brewery is transported to the Collins Farm in Port Alberni where it is used in livestock feed. And the trub – the leftover hops and barley protein – is a great fertilizer. “We’re hoping local horticulturalists will come and take it,” said O’Malley. Given that water is always at a premium in Tofino, they’ve put some thought into how to use less. The unfermented beer (wort) is cooled through a heat exchanger where it passes by cold water to bring it down to the right temperature to pitch the yeast. “We then recapture that water and use it for the next beer,” explained O’Malley. In terms of sourcing ingredients, the majority of the grain is Canadian, and the hops are all from the Pacific Northwest. It can be difficult to get ingredients from this area, as many are snapped up by other BC microbreweries, said Neufeld. A microbrewery is defined in Canada as one that produces less than 60,000 hectoliters of beer per year (one hectoliter is about 12 cases of 24 bottles). Hopefully that will be enough to satisfy Tofino and Ucluelet, which is where Tofino Brewing Company will be focusing their energy for now. “We’re looking to establish ourselves as the local brewery before we even think about distribution,” O’Malley said. Draught kegs are being distributed to local Tofino restaurants, and have also been made available to purchase, along with the growlers, directly from the brewery. Tofino Brewing Company recommends you drink your growler within 48 hrs, after which you give it a rinse and return for a refill. The brewery at 681 Industrial Way (units C and D) is open from 12pm until late daily and the public is welcome to drop in for tastings and tours. Along with growlers and kegs, glassware, T-shirts and hoodies are also available. To contact Tofino Brewing Company, call 250.725.2899 or email info@tofinobrewingco.com. Also look for the brewery on Facebook and Twitter. Hailing originally from Barrie, Ontario, Jen Dart has called Tofino home for the last 12 years. 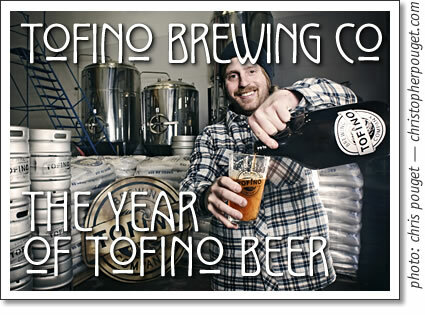 2010 is the Year of the Tofino Beer, when Tofino finally got its own brewery with the opening of Tofino Brewing Company.